History: (Untold Tales of Spider-Man#13 - BTS) - As Zemo began to gather allies to confront the Avengers with, the Black Knight made a bold bid for "captaincy" in his group, kidnapping the princess of Ksavia. As the Black Knight contacted Zemo to boast of his success, Spider-Man invaded his hideout, and Zemo told the Black Knight to deal with him, and that he would be contacted later. The Black Knight was finally defeated by Spider-Man and the Human Torch, but someone-- possibly an agent of Zemo's-- collapsed a building on the two heroes so that the Black Knight could escape. (Avengers I#6/Avengers: Earth's Mightiest Heroes#3) - The Masters of Evil were gathered together by Baron Heinrich Zemo to aid him in his revenge against Captain America by attacking his new allies, the Avengers. The Radioactive Man, Melter and Black Knight were outfitted with devices to spray the streets of New York with Zemo's Adhesive X in order to draw the Avengers out. The Masters managed to affix Captain America and Giant-Man to the pavement with Adhesive X and held Iron Man and Thor at bay. (Avengers I#6) - Zemo sent the Masters out to distribute more Adhesive X, but Rick Jones and the Teen Brigade had replaced it with an solvent created by Paste-Pot Pete that set their earlier victims free. The Avengers returned and fought the Masters once more, with Thor defeating the Black Knight, Iron Man trapping the Radioactive Man in a lead-lined balloon, and the Melter's costume shorted out by Iron Man. Captain America faced Zemo in combat, but Zemo fled with what he thought was a sample of the solvent, only to discover it was actually tear gas; he crashed his ship. (Avengers I#7 (fb) - BTS) - Zemo slipped through the Avengers' fingers and returned to South America. (Avengers I#7) - Zemo was contacted by the Asgardians the Executioner andthe Enchantress, and they joined with him to become the new Masters of Evil. The Executioner masqueraded as Hans Grubervelt in order to lure Captain America to Zemo's temple, while the Enchantress placed Thor under her hypnotic control, and sent him to battle the other Avengers. Captain America managed to chase Zemo back to America, and the Enchantress and Executioner boarded Zemo's airship. Thor, having regained his senses, cast the ship into a space-warp, sending them to a place between the sixth and seventh dimensions. (Avengers I#9) - The Enchantress guided the Masters back to Earth, and Zemo came up with a new scheme. He had the Enchantress bring him Simon Williams, an industrialist rival of Tony Stark who had embezzled funds. Zemo designed an ion-ray machine which transformed Simon Williams into the powerful Wonder Man, but Zemo kept him under his control because Wonder Man would die without an antidote only Zemo could provide. The Masters launched another attack on the Avengers in which Wonder Man seemingly came to the Avengers' rescue. The Enchantress used her magic to help Wonder Man worm his way into the Avengers' confidence as he claimed to be a super-hero. Wonder Man finally led the Avengers into a trap in the Amazon jungle, defeating the entire team by himself. 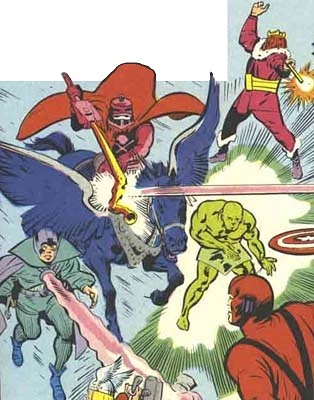 However, Wonder Man could not bear to see the Avengers killed, and helped free Thor from the Masters' custody. As the Avengers rallied, Zemo, the Enchantress and the Executioner fled, and Wonder Man, deprived of Zemo's antidote, died. (Avengers I#10) - The Enchantress received a mental probe from Immortus>, who offered to assist the Masters against the Avengers using armies of people taken from the past (actually Space Phantoms). Immortus trapped Captain America in the past by using Rick Jones as bait, but after the Captain overcame Immortus' men, he was returned to the present, just in time to help save the Avengers from the Masters of Evil. The Enchantress helped the Masters escape by traveling back in time to just before Immortus' mental probe. This time, she did not respond to the probe. (Avengers I#15) - Zemo captured Rick Jones with his airship and brought him to his base in the Amazon, then sent the Executioner and Enchantress to break out the Melter and Black Knight to oppose the Avengers. While Thor, Iron Man, Giant-Man and the Wasp fought the four Masters, Captain America set off to the Amazon to rescue Rick. In battle with the Captain, Zemo fired a wild shot from his gun which caused an avalanche, crushing him to death. (Avengers I#16) - To prevent further damage to New York's streets, Thor turned to "Plan D," teleporting the Avengers, Black Knight and Melter into another dimension where the two villains' technology did not work properly. They were quickly defeated, and the Enchantress and Executioner returned to Asgard. Fans debate whether or not Wonder Man counts as a Master of Evil, but the Official Handbook of the Marvel Universe Master Edition listed him as such, so that's what I'm going with.